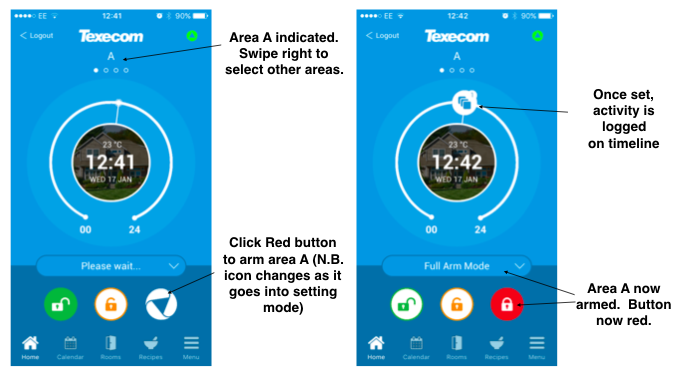 The following is a guide to how to use the Texecom Connect App, and turn your Texecom Premier alarm system into a smart alarm system, enabling you to control devices beyond your alarm and turning your home into a smart home. If you’re setting up your Connect App for the first time, you probably need to check out the first timer guide here, as the following instructions assume that you’ve already installed and done the basic app configuration (which would have normally been done by your installer). 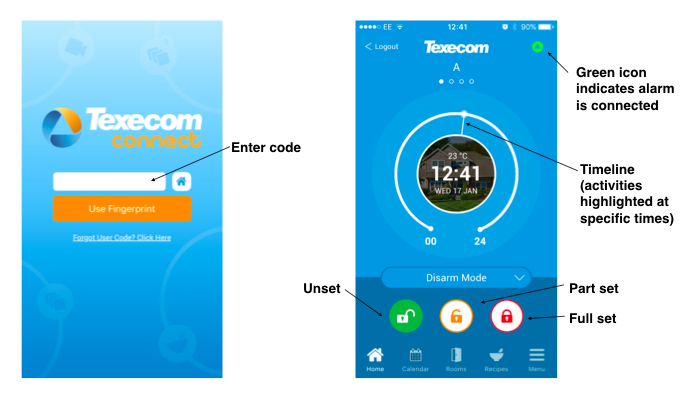 The Texecom Connect app has x6 core functions, enabling you to control your alarm in a smart way. These are . . .
To access the Connect app, you need to enter your secret code or use the finger print recognition (if you’ve previously set this up). The Connect app has this layer of security to ensure that other people can’t easily log-on and gain control of your alarm system. The home screen gives you access to all the main features of the Connect app. One important icon to be aware of is the green icon in the top right of the screen, which if lit green indicates that your alarm is connected to the Texecom cloud (and is therefore accessible via the app). If it’s not lit green, you won’t be able to control your alarm via the app. N.B. this doesn’t mean your alarm isn’t working, it just means that it isn’t remotely controllable via the Connect app. 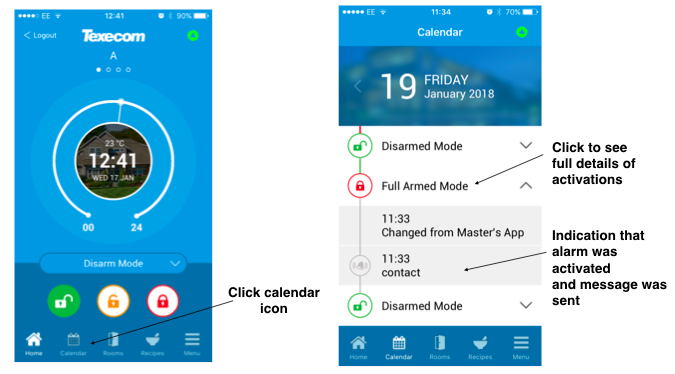 To arm your alarm using the Connect app, all you need to do is to press the ‘red lock’ button (located bottom right of the screen). Once the alarm is armed the event will be indicated on the timeline (i.e. the circular ring at the centre of the screen that runs from 00 to 24). If there’s an activity on your alarm (e.g. 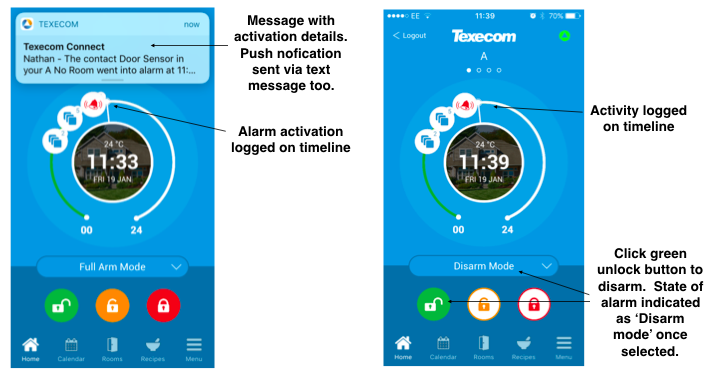 if an alarm sensor is activated) then the app logs the activity on the timeline, and then sends a push notification to your mobile phone (i.e. a text message). When your alarm is activated, you'll be sent a push notification (if set up) and also the activation will be logged on the Connect App timeline. To disarm your alarm, simply press the green ‘unlock button’ (situated on the bottom left of the screen). The disarming activity will then be logged on your time line. To access the calendar functionality, simply click the calendar icon at the bottom of the Connect app’s home screen. The idea of the calendar is to provide you with an overview of events associated with your alarm. For example, you could see when your cleaner arrived and left your house; or you could see when the alarm was activated when you’re on holiday. Simply scroll down the list of events, and then click into each event to see more details. This gives you full details of each event. 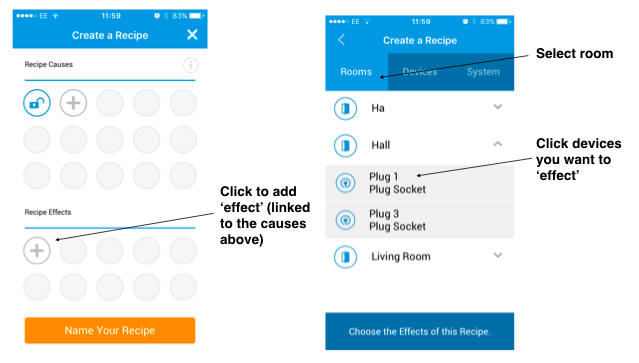 The idea of ‘rooms’ in the Connect app, is that you have ‘devices’ associated with each room, and then you can manually or automatically (via recipes) control devices in each room. A device might be a ‘sensor’ or something like a ‘smart plug’. 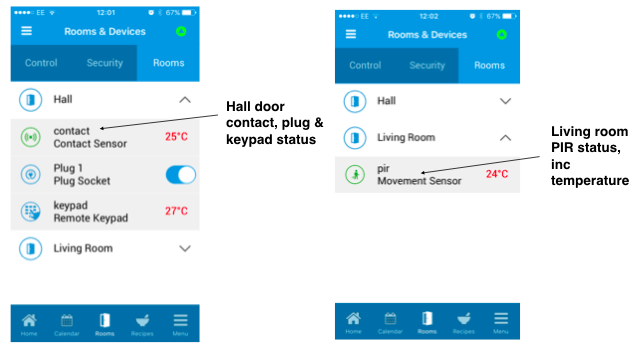 This section of the app is therefore broken into x3 sections: control, security and rooms. Control relates to things like ‘smart plugs’ (which you can control things with); security relates to sensors (e.g. a motion detector or door contact); rooms relate to specific rooms you have plugs and sensors in. Using the Connect app you can check the status of each of these devices. For example, you could check to see if a smart plug is on, or you could see what the temperature in your living room is. 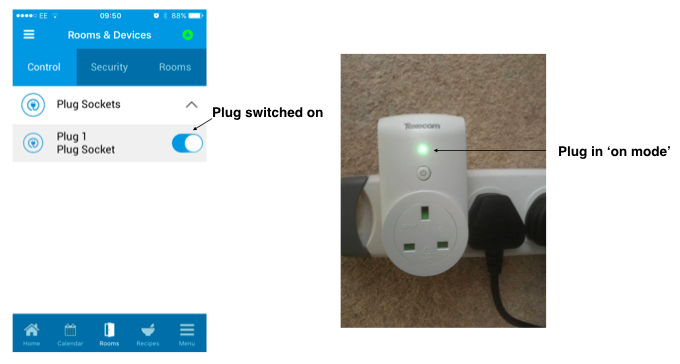 You can also control devices in each of your rooms, for example turning your smart plugs on and off. The ‘security’ section let’s you view all security sensors connected to your system, and enables you to see the status of each e.g. which have been activated, the surrounding temperature of each sensor. The ‘room' section let’s you see the different devices (e.g. movement sensors or contacts) active in each room, and enables you to see the status of each, including the temperature of the room - as each sensor has a temperature sensor included. A recipe is a combination of causes and effects, meaning that when one (or more) thing happens on the alarm system, then this causes another thing on the alarm to happen. For example, you could create a recipe that said ‘turn on hall light when front door is opened & alarm is set’ - which would mean that every time you arrived home and opened the front door, your hall light would turn on so that you could see what you’re doing. 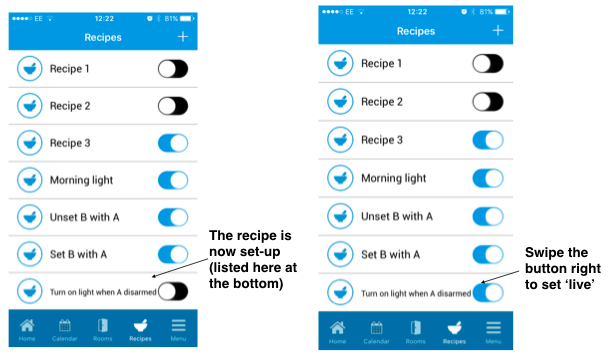 Add a recipe to your alarm system by clicking the ‘+’ button on the top right of the screen. 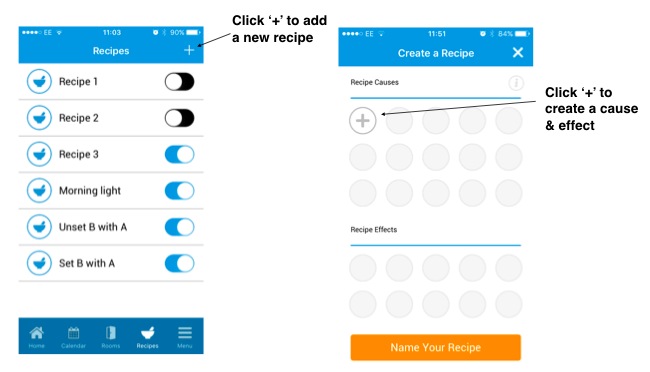 Then to start making a recipe, you need to click ‘+’ in the cause section. Then select what ‘cause’ you want to make, out of the list of system, devices and rooms. 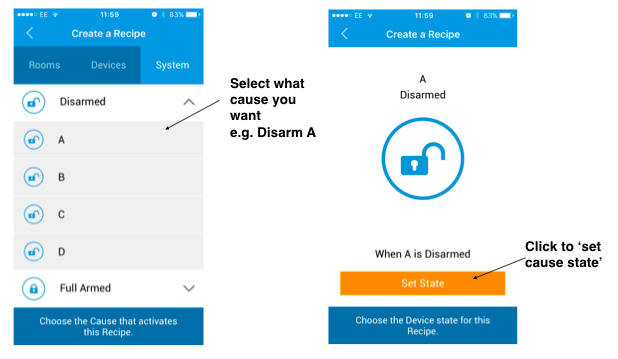 For example, choose ‘disarm A’ (meaning disarm area A of your alarm). You then need to select an ‘effect’ to be linked to your cause(s). For example, you could choose ‘room’ and then select ‘devices’ in the room which you want to be linked to the effect - e.g. a Smart Plug socket. Once you’ve chosen your plug socket, you then need to select the ‘state of the plug (i.e. on / off), and if you select ‘on’ you then need to select a ‘duration’ of the effect. 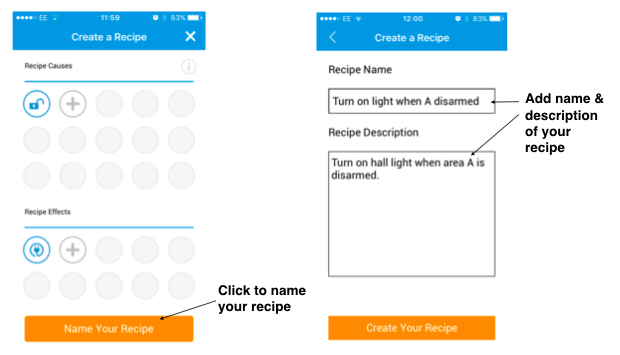 The final stage is to give your recipe a name and description, and once you’ve done this your recipe’s ready to be used! N.B. the recipe will be listed at the bottom of the list. 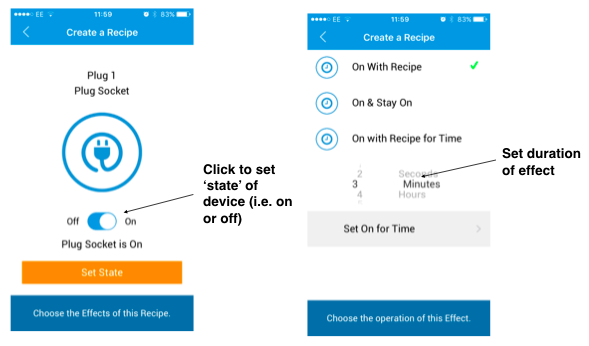 To turn the recipe on, swipe the buttom right and it'll turn blue (meaning it's live / working).